When you are working on completing a task that requires multiple steps, you need something that will help to keep you organized and on track. 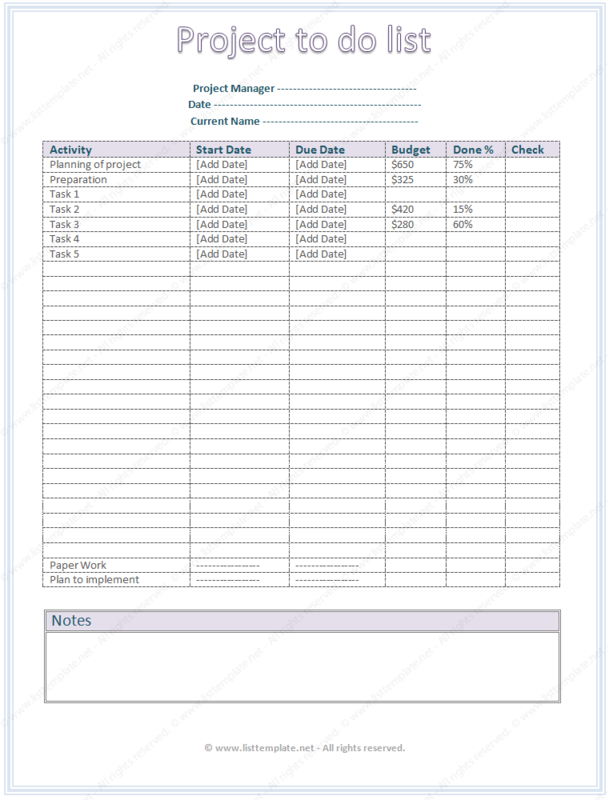 This project to do list template with budget will keep you going strong. You can easily complete your task in an organized and professional manner through the help of this template. This template includes space for the name of the project manager and the date. The template includes plenty of room for you to list each step that needs to be completed in order for the final project to be done. You can even include a start date and an end date for each of the tasks that need to be completed. Through the help of this to do list template, you can track what percentage of each task has been completed, and the budget for each task, too. This template was created in Microsoft Word®, and it allows you to complete projects in a professional and organized manner.